Report of a Hawk down on the main road of Hornby. The story can be read here. 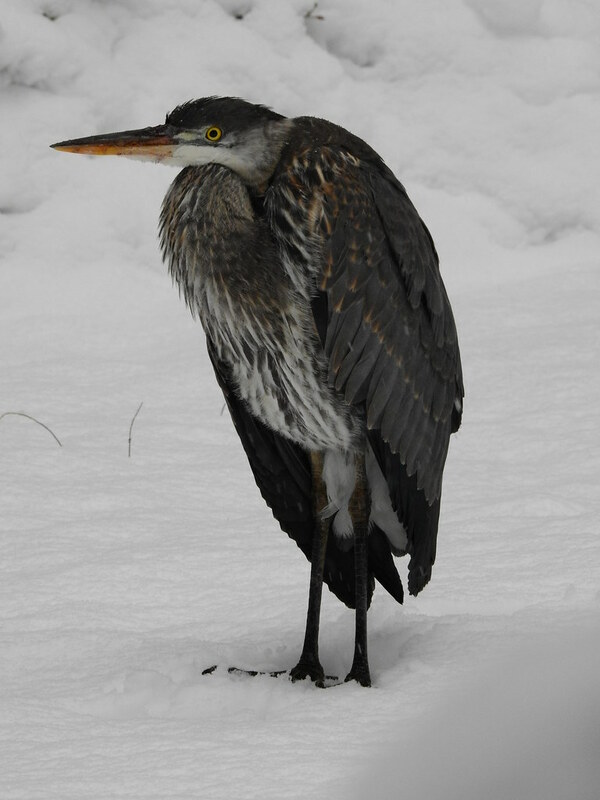 i get a call from a neighbour nearby that a Great Blue Heron has landed on the edge of her deck & was just standing there in the snow. The story can be read here. 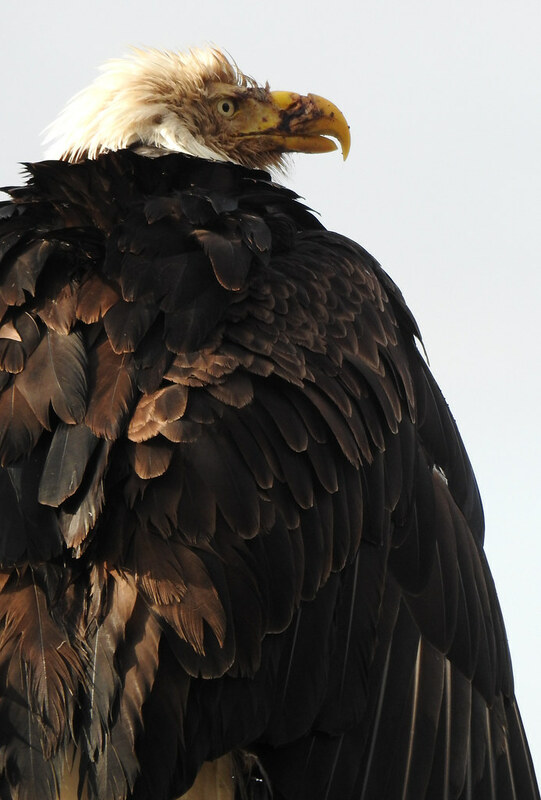 i am sent fotos of an Eagle at Phipps Point who has a terribly injured beak. The story can be read here. We are walking down at Heron Rocks when a lone Sea Lion is spotted on the rocks in an unusual spot. The story can be read here. i hear about a Bird with orange colouring that was lying on the road with a broken leg. The story can be read here. i hear about an Eagle standing on a house*s deck for an unusual amount of time, & then the Eagle has a stumbly walk when she moves away from the person. The story can be read here. i got a HEART call about fledgling Crows down on the ground in a dangerous spot at Grassy Point! The story can be read here. VERY young Eaglet is found under Wiig Nest Tree! The story can be read here. TWO Seal pup rescues on the same day! Norm & his helicopter & the Hornby Water Taxi are involved. The story can be read here. Merlin fledgling, likely from the Nest we observe on the webcam, spotted at Grassy Point on a fence post. The story can be read here. Marielle calls me about a Seal pup caught in the rocks at Heron Rocks! The story can be read here. Marielle calls me about a Seal pup found by visitors at Helliwell! The story can be read here. A lovely Orange-crowned Warbler hits a window. The story can be read here. First Wildlife rescue call of 2017! Wren & i were both called by MARS & a message left for both of us. i came in quite a bit later & had only a short time before i had to be somewhere else! The message said a Hawk was reported down on our main road. i figured hit by a car? i listened twice to the message & then called MARS back. Reg answered & said the woman who had called me had talked to someone who had seen a Hawk down on the main road, but that she had been calling the reporter back & not reaching her. i tried her number & lucked out & got her right away. i think she had left Hornby, but had seen a Hawk on the side of the road, eating a dead Deer. The Hawk had been wobbling about the road & not flying, so she had called MARS. But it turned out that after she called the *Hawk* had managed to fly off & land in a nearby branch where they had a battle with an Eagle & then both flew off. As far as i know, Hawks don*t eat Deer? i asked her how big this Hawk was. Aha, i believe this was actually a young Eagle & explained that to her. Anyway, sounded like all was well after all & i was greatly relieved not to have to squeeze a rescue into the little time i had left before dark! i went by the area today, as i also got a call from a friend today saying she*d seen a young Eagle at the side of the road eating a Deer & not scared of traffic at all. She called me quite a while after her sighting but i went to check it out anyway. As i was driving past, i did indeed see two young Eagles flying over the road, but though i drove back again, i never did spot the Deer they were eating. Yesterday afternoon I was pruning fruit trees not far from the address that the message from MARS mentioned. I could hear eagles calling from down the road the whole time I was there. Calls and trills of adult eagles, and the beautiful rusty-hinge calls of youngsters! I figured that might be where that deer carcass was. I sure wished for the time to go check it out but I wanted to get as much work done as possible before dark. i got a call from a neighbour nearby that a Great Blue Heron had landed on the edge of her deck & was just standing there. She was worried about cats being around, or that something was wrong, so she wanted me to have a look. i was reluctant to go out because i had just gotten home & wasn*t keen to go out into the snow again, even though she is a short walk away. So she offered to pick me up! 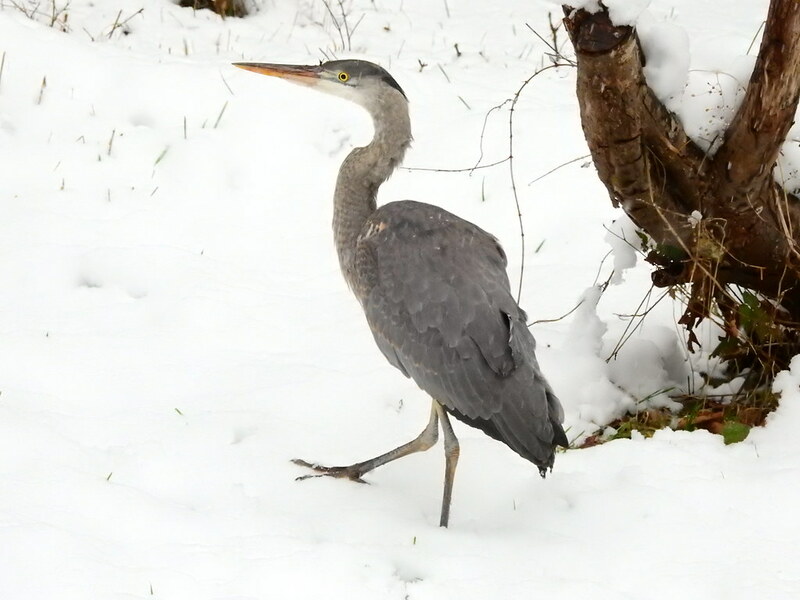 By the time we got there, the Heron had left the deck & was standing in the yard. We snuck around the house so that i could get some assessment fotos. 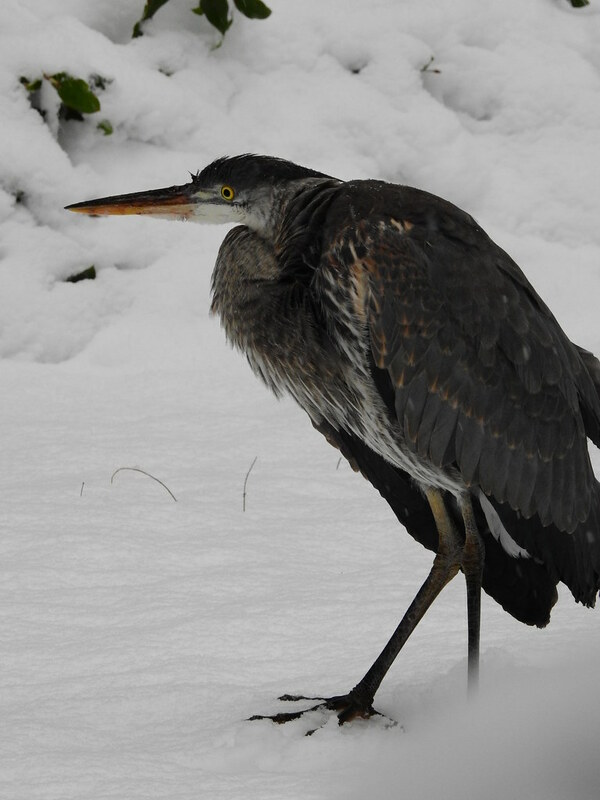 Sure enough, the Heron was just standing there, relaxed in the snow. 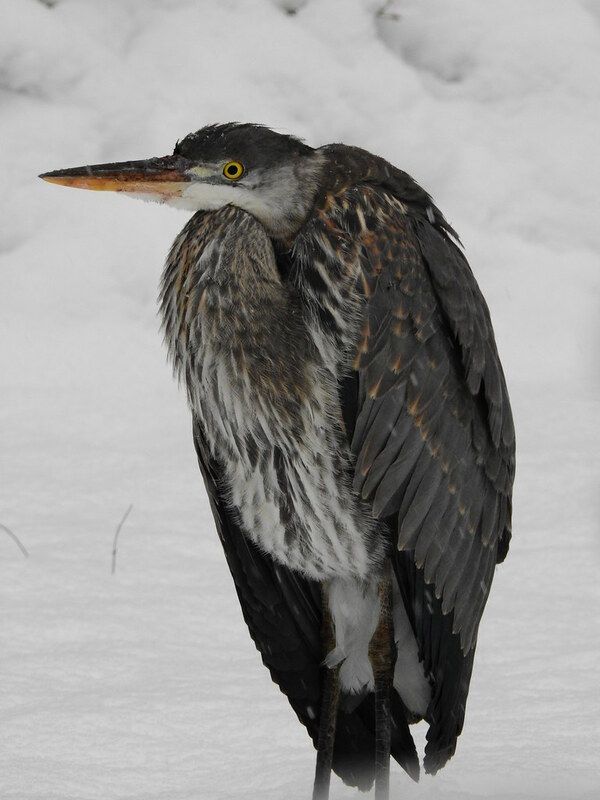 i was wondering if this was the Heron that i first heard about here, who then got released here, & what do i know, but this sure looked like the same small Heron, & this spot is not at all far from the pond where he had been released & was hanging out for quite a few days. Here we are getting closer & he is starting to walk away slowly. A video of the walking. After this he flapped & took off, but didn*t go very high & appeared to just sail down the road, so we went looking for him & sure enough there he was in the ditch on the side of the road just uphill from Grassy Point. i figure i will be hearing more about this youngster. Sure hope they can find food. Must be hard to find food with all that snow! Hope it melts soon! Thank you for telling us about this bird, booni...one of my favorite species. Hope he is okay.... I am sure he is wondering ..." What's up with all this white stuff!!" 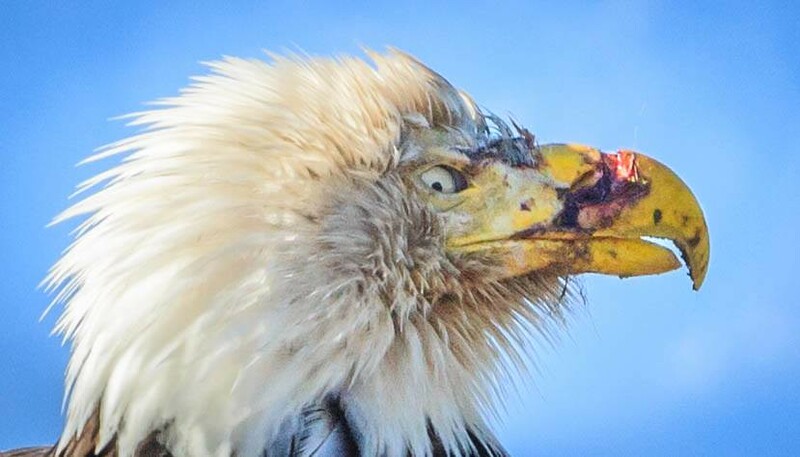 A friend sent me a bunch of good fotos of an adult Eagle with blood all over their beak. 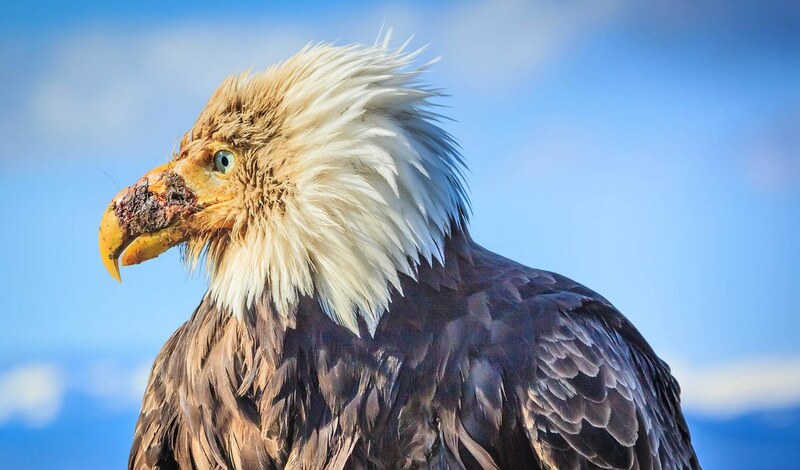 i looked at the fotos before reading her e-mail & noticed that the Eagle seemed to have a bite injury across their beak, especially visible from the right side! When i read her full message, this was why she*d sent me the fotos. 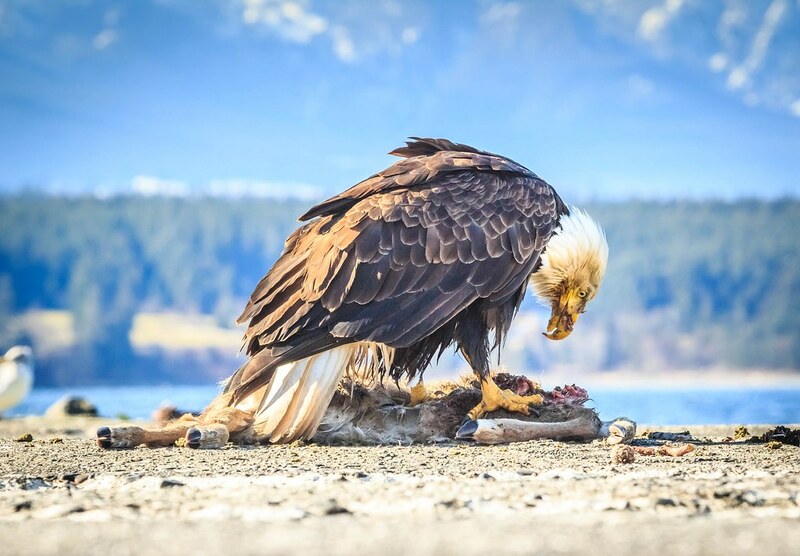 Someone had put a road kill Deer on the cement jetty at Phipps Point & the Eagle was trying to eat this. There was also a dead Sea Lion attracting tons of Eagles north of the Point. i got more good fotos of this Eagle from Maija Maltais. Then i got a link to fotos on someone*s facebook page here. i also got a call from MARS two days later saying a man had walked right up & touched the Eagle that day. We went right down there looking & have been looking ever since but have not been able to find this Eagle. Mum Hornby had a very similar injury, however she had a whole lot of other injuries as well. Whew, booni! That looks like a painful injury. Sorry you couldn't find that eagle. That is nasty... hopefully it can be found and something done. Thanks for looking Booni! i was invited for easter brunch yesterday & was asked right away about the Heron Rocks Sea Lion, which prompted a young fellow to tell me that he had found a Bird with orange colouring on the road with a broken leg! He said he had moved the Bird to the grass at the side of the road. i followed him back to the site with a small shoe box lined with a towel, ready to go. He looked uphill, i went downhill & spotted the poor fella right away, standing on the side of the road with his eyelids closed. He didn*t even budge when i walked right up to him & grabbed him. But fight & flight took over when i popped him in the box! He got out again before i could close the lid! He flapped into the bush, poor guy, so i had to catch him again & this time i was more careful with the lid. i had blood on my hand afterwards. There were a couple heading off Hornby & going to Royston on Vancouver Island, so yay, they agreed to take the Bird & arrange for MARS to meet them there. Not long after the planned meeting, i got a call from Reg. He said the leg was broken right through, with only a small bit of skin & a tendon holding it on. The blood supply was cut right off & could not be connected again. The dangling leg/foot would only go necrotic, so he said the tough decision was made to euthanize him. He was a lovely male Towhee. Sometimes when humans do their very best, things still turn out badly. Sorry for the poorblittle Tohee who suffered like that. Now he is out of pain and at rest.